(SASD) - We are pleased to welcome Dennis Scherz to the Spooner Area School District as the new principal of Spooner High School. Mr. Scherz brings a depth of successful experiences to Spooner. He served for 25 years in the Maple School District at Northwestern High School. He was a Social Studies teacher and served as the Department Chair for a number of years. Dennis was the Assistant Principal and Dean of Students at Northwestern from 2012-2015. During his time at Northwestern High School he also served as a coach, athletic director and provided leadership for a number of school programs. Dennis served in the Nye County School District in Nevada from 2015-2018. He was the High School Principal from 2015-2016. He was promoted to Associate Superintendent in 2016. During his time in Nye County, he led initiatives focused on curriculum development, providing students with enhanced academic supports and improving school climate. Mr. Scherz holds a Bachelor of Science Degree in Secondary Education - Social Studies from the University of Minnesota. He went on to earn a Master of Science Degree in Educational Leadership from Viterbo University. We are fortunate to have an educational leader of Dennis' caliber joining the SASD. His track record of successful educational leadership experiences, focus on student success and commitment to working collaboratively with staff and the community make him a valued addition to the SASD and our community. Spooner High School Principal Sarah Johnson has announced her resignation from the Spooner Area School District. The Spooner School Board accepted her resignation during the board meeting on Monday night. 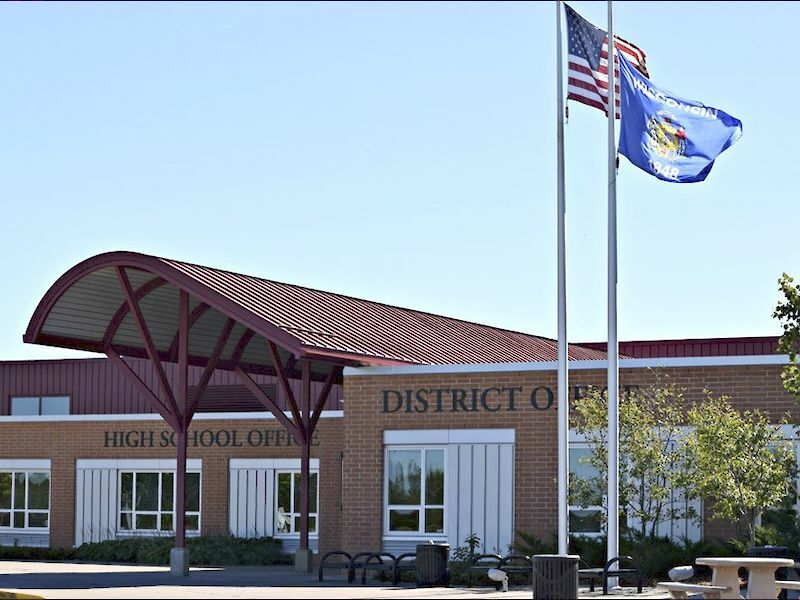 "What will likely come as a surprise to my local learning community and greater professional learning community is that the Spooner Area School District Board of Education accepted my resignation effective at the end of this school year at their board meeting this evening. I know there will be several speculations as to why this action occurred and after reading this, there still may remain rumors and skepticism. All I can do is speak truth to it and that is what this post is about tonight. My contractual timeline to resign without liquidated damages is 120 days, and that certainly played a factor in the timing of resignation submission, but what you will learn if you stick through this post is that the decision itself is a result of a bold leap of faith." "As many know, I have been engaged in co-authoring a book with two of my most respected colleagues and close friends. Through this labor of love of writing a book about seeking balance and making intentional steps to live the message, I have undergone a beautiful transformation. The truth is that I have discovered a level of balance in life that is not perfect, but is filling. My marriage has been restored and strengthened, my daughters receive a large amount of my undivided, loving attention, my running streak has continued (1319 days at the posting of this message), I have grown professionally through writing and networking, and my position has become manageable in ways that have restored deep levels of joy to it. Most importantly, I have engaged in intentional devotion, which has led to spiritual maturation and a significant daily practice of listening to the messages spoken directly to me through the power of the Holy Spirit. My daily life is directed through the quiet conversations, and the level of peace that has prevailed every aspect of life is in direct relation to that crucial daily practice. It is through this relationship that the decision to resign from my position at Spooner Area School District came. The message is clear on the front end of it with the decision, but what comes next remains uncertain. "Why resign a position so early in a school year and without a landing space? Here is my answer. I need to let go to levitate. On December 30th, I posted about my #oneword2018, which is #RISE. In that message regarding the word, I knew that there were changes coming for the year that would require me to be bold in order to rise with His purpose in me. In that post, I alluded to several different possibilities, and I was aware that I would need to speak His message through me with all I do. On January 1st, I was given the direct message that I was to leave my current position. At that time, there was no further information shared but a few hints about what a future might hold. On January 11th, the message came through with levels of clarity that still astonish me. I became convicted that exact day,and peace regarding the decision to leave has been the prevailing emotion though many have been present. I am to leave Spooner High well and with grace. I am not to know what is coming next, but taking this leap into the cloudy next phase is exactly what I am to do and being honest about it is also part of the message and His purpose within me. It may sound strange to some and absolutely crazy to others, but I have complete trust in this message and know that whatever is next for me professionally is where I am called. Logical questions are always about what is next. That is human nature. However, this decision is not made with human nature. If it were, I would not be leaving. I would stay and continue the important work we have been engaged in that is so student focused, myy heart pounds. If it were human nature, I would stay and enjoy the security that comes with knowing there will be income to provide for my family and what that looks like. If it were human nature, I would stay and sing my heart out at sporting events with Mrs. Bacha as often as possible. If it were human nature, I would stay and know the relationships developed with staff, students, families, and community members over four years would only deepen to richer levels and continue to positively impact the school culture. "However, this decision is not made with human nature. On any level. It is made with the bold, faithful, peace-filled knowledge that I am not supposed to stay and I am not supposed to know what is next. What I do know is that the decision will be blessed because it is pure and an obedient risk that will allow me to #RISE with His purpose in me. The rest are simply details that will fill the pages in the upcoming chapters but will not define completely the theme. "My goal for the remaining time I have at Spooner High School is to engage fully with each stakeholder with whom I am blessed to work. My light will pulsate with as much energy as the people around me can stand. I will not take any opportunity to speak grace and truth for granted to leave the strongest impact for our students. My purpose will be more focused to close out the year where my interactions will be characterized with even more intentional kindness, warmth, and deep love. I care about every single soul that breathes in this organization, and being gifted with the remaining four months of this school year is something I see as an important opportunity to leave everyone well. It is also important for me to lead boldly and efficiently so that the next person who takes over the building leadership can do so with a graceful and strong transition. I know how important that will be, and I consider it one of my most important final acts of service to this learning community. "The truth is that none of us are guaranteed tomorrow. One of my life quotes has long been “Live the way in which you want to be remembered.” For me, that extends beyond the next four months, but its simple wisdom is what I hope to exude. In this case, I want to be remembered for the choice to lead by following, raising my voice with His purpose in me, and shining light, love, laughter, and song to those I am blessed enough to have in my path. "The rest can fade to the bottom into sediment, and it is through truth and obedient risk that my purpose through Him will #RISE within me. I will let go to levitate."